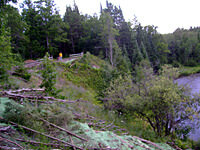 The third and final “rope swing” erosion site completed in fall 2009. The position of this site in relation to the river and direction of flow, the presence of heavy foot traffic from the general public, and gullying associated with stormwater runoff were all cited as the sources of the erosion. In the Black Lake Watershed Management Plan this site was listed as a "severe" erosion site and it was noted that they are contributing to the sediment load, the Black River's number one pollutant. Where sand formerly eroded into the Upper Black River and covered crucial sturgeon spawning sites, native plants now hold the streambank in place. From here, much of the success now lies in the hands of the public. 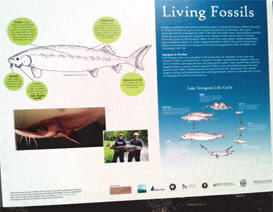 Visitors will now see educational signage before trying to catch a glimpse of the state-threatened lake sturgeon. 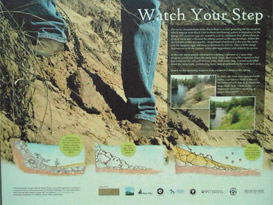 Three signs were placed early this spring, one at each erosion site, to teach the visitors the importance of having healthy streambanks and how excessive erosion and sedimentation can negatively impact the river and the sturgeon many of them are there to view. The topics on each sign vary, including the biology and life cycle of the sturgeon, streambank rehabilitation and erosion control, watersheds and their management and ways each visitor can help protect rivers, watersheds and the wildlife that depend on them. As part of a collaborative effort, streambank erosion control projects focused on protecting lake sturgeon in the Black River now depend on healthy roots and leaves of native plants. Since 2007, four severe erosion sites along the Black River have been stabilized using “softer” approaches, which predominantly use live and dead plant material. The goal was to minimize erosion to stop unhealthy amounts of sand from entering the Black River. Sand can have a detrimental effect on spawning habitat used by sturgeon and other fish. At each site, human foot traffic prevented the establishment of new plants that would normally hold the soil in place on these tall, steeply sloped banks. So the first step was to use split-rail fencing and the placement of trees and brush to manage the human influence. At the rope swing site, quite a bit of earth-moving was done, including the creation of a berm to control stormwater. Whole trees were placed on the bank to slow any movement of sand and to block access while new plants grow. 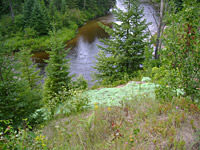 Over 700 ft. of river bank was stabilized using cedar terraces, soil, seed, mulch and stone. 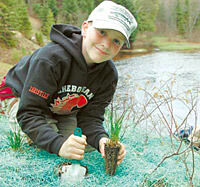 More than 3,500 native perennials were planted to jumpstart the healing of the banks with live, healthy plants. In 2010, the scope of the project continued to broaden. This included an assessment of the amount and condition of habitats available to adult and juvenile sturgeon. Using those findings, we increased spawning substrate by 3240 sq ft at Site C by adding field stone to the river bottom. Furthermore, food and materials were provided to the hatchery for the 2010 season. 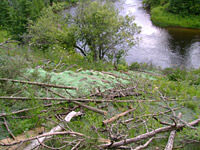 Long-term success of the project lies in public understanding of how erosion impacts sturgeon and respect for the completed work. 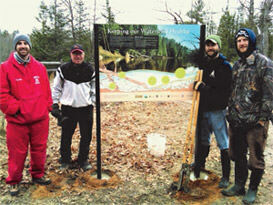 To help with that, we will be placing large, full-color, interpretive signs on site. The signs highlight project details, sturgeon biology, impacts caused by human activities, and how we can all help. Look for the new signs during Sturgeon Guard 2011. Project partners include the National Fish and Wildlife Foundation, Michigan Department of Natural Resources and Environment, Natural Resources Conservation Service, the Great Lakes Commission, Michigan State University, Huron Pines AmeriCorps, Huron Pines, and Sturgeon For Tomorrow. Finally, the incredible amount of volunteer participation in this project demands attention. It was integral to getting things done. In the past 3 years over 100 volunteers from numerous organizations joined the effort. Whether during organized events, or when visitors would happen upon our crew, people consistently jumped in to help. To those volunteers, “Thank you.” By participating, you now have a firm understanding of why the project was chosen and completed, but I hope you also take ownership and pride in the accomplishments. Please help us in continuing to promote and maintain all of our work on this great project. 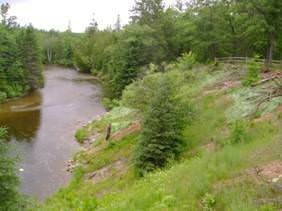 Streambank on Black River in 2006 prior to any erosion control work being completed. Same streambank (2009) after stabilization practices and regrowth of native vegetation. Black Lake's threatened sturgeon got a helping hand May 9 when Huron Pines AmeriCorps members and volunteers helped protect their Black River spawning habitat through erosion control. The problem: loose soil tumbling into the river covers up cobblestones essential for sturgeon eggs to attach to when they are laid. No cobblestones equals no sturgeon. Nearly 60 volunteers gathered at a camp above the river that morning with a daunting task ahead: stop the bank from eroding into the river by replacing topsoil, rolling out hundreds of square feet of landscaping fabric and planting more than 3,000 native plants on the steep slope — all before the rain moved in. 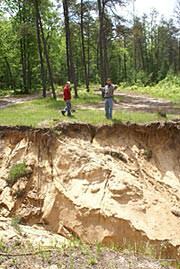 The effort will help keep further erosion from occurring. Grayling-based nonprofit Huron Pines AmeriCorps teamed up with Sturgeon For Tomorrow, Boy Scout Troop No. 645 of Harrison, Cheboygan 4-H Archers and dozens of volunteers to get the job done in a few hours. The site was one of three receiving the same treatment funded by $75,000 from the Great Lakes Commission, National Fish & Wildlife Fund, Huron Pines and Sturgeon For Tomorrow. "This erosion started by dam activity," said Huron Pines' Restoration Project Manager Patrick Ertel as he briefed the volunteer crew that morning. "It was perpetuated by people walking down the banks to the river to see the sturgeon as they spawn." Ertel encouraged volunteers who spotted sturgeon to take the time to view the fish but at the same time treat the bank with respect. "I want people to be excited about why we're here -- for the sturgeon," he said. A group of campers at the site calling themselves the Sturgeon Guard keep watch for poachers fishing on the closed section of river. The sturgeon were mostly elusive that morning but a crew with Michigan State University (MSU) were combing the river and tagging sturgeon as part of an ongoing study of the fish's population in Black Lake. Fisheries professor Dr. Kim Scribner was leading the MSU group that morning and said two fish were tagged, including a 90-pound female approximately 60 years old — relatively young and small, considering females can reach 200 pounds and 150 years of age. Scribner explained the sturgeon spawn in three runs and this day was in between runs. "This is the start of the second run of fish — they spawn at ritualized times, with the early fish heading upriver and the later fish spawning downstream" Scribner said. He added MSU has invested $1.4 million in sturgeon research over the past eight years, studying adult spawning behavior, environmental cues to spawning, egg mortality and more. According to the research, the natural population has been declining. The population has been supplemented by hatchery fish born from natural eggs. "This erosion is really compromising the substrate the eggs attach to," Scribner said. Sturgeon For Tomorrow president Brenda Archambo reiterated that point. "Sturgeon have been around for 136 million years, but in the last century they've nearly been wiped out," she said. According to Sturgeon For Tomorrow, the sturgeon of the Black River Watershed is one of the few remaining wild populations not totally dependent on hatchery programs. For some volunteers the project was all about the fish and their environment. "Ya gotta love every minute of it," said Derek Getz Cheboygan 4-H Archery, who's been doing these projects for the past eight years and is getting his 22-month-old daughter involved, too. "I want to do something good for the environment. For others, it was just about being on the river. "It's so soothing to be on the water," said Carol Rose of Hillman as she planted shrubs on the slope. "It's part of being in Michigan. It defines who we are." I was offered the opportunity to give back to nature, and I took it. So did 50 or 60 others with a shared goal of helping a rare fish species and, at the same time, helping reverse damage man has dealt its habitat. Two weeks ago, I set out to the Black River in Cheboygan County to join volunteers on a project to stop erosion at a crucial lake sturgeon spawning site (see related story). That morning I planned to set my pen and paper aside to get my hands filthy with topsoil rather than newsprint ink. Three hours later, the back of the map I'd used to find this place was scribbled with quotes and my camera held 40 images of volunteers planting shrubs in the topsoil I helped spread. I succeeded in getting dirty, evidenced by the fingerprints smudged on my shutter button and across my notes. Better yet, I was able to shine some light on the dedicated men, women and children willing to give up an entire Saturday to help a fish they may never even see in their lifetimes. Along with the others, I quickly conscripted myself into a job — myself choosing to spread and smooth topsoil over a steep, eroding riverbank. Some shoveled soil into wheelbarrows and others dumped it on the bank, never sending the wheelbarrow barreling down the slope, but coming close every once in a while. Some observed until they knew exactly where they'd serve the project best, then leapt into action with hand trowels and trays of young shrubs to plant. Talking to fellow volunteers, I soon realized something special was happening here. They'd come from all over — at least one was from Lansing — and, for many, this was not their first time on such a project. They deserve recognition. Matt Reaume is a member of Huron Pines AmeriCorps whose tattered white baseball cap is a dead giveaway of a simple fact: Reaume is an outdoorsman. An avid camper and trout fisherman, Reaume has to venture far north from his home to find good trout fishing but says it's always worth it. He's a man who's perfectly at home in a plaid shirt and blue jeans. Derek Getz with Cheboygan 4-H Archery has been doing this for the past eight years and, on this day, brought his wife, Maggie, and 22-month-old daughter, Stacey, to the river with him. "She loves the outdoors," Derek said of his daughter, who was wearing a "Sturgeon Guard ROCKS!" sweatshirt and was captivated by a junebug Derek found burrowed in the sand. He and Maggie were soaking up the moment they were sharing with their daughter. "You gotta love every minute of it," Derek said. Carol Rose of Hillman said she simply enjoys being on the river, but was humble in the fact she planted dozens of shrubs on the bank to help stop erosion and preserve the very river she was listening to. "It's so soothing being on the water," she said, her hair blowing free of a Michigan State Spartans headband. "It's part of being in Michigan. It defines who we are." Then there's the people who volunteer or whose job it is to design such a project. All of the Huron Pines staff and volunteers with Sturgeon For Tomorrow and Sturgeon Guard, who do these jobs because they truly believe in the importance of preserving the outdoors, should be commended. So should the people who assembled and served an incredible lunch buffet to hungry volunteers — in the middle of nowhere. Thank you to everyone who helped out. Even though no sturgeon showed up that day, this project helped ensure these awesome fish will be around for future generations. Chris Engle is an avid outdoorsman and outdoor columnist for the Gaylord Herald Times. He can be reached at 748-4517. The erosion sites (sites B and C) on the Upper Black River affecting the sturgeon spawning habitat received TLC this spring. With the guidance of Patrick Ertel, Huron Pines, terracing was put on the slope and split rail fencing at the top of hill. This was done to control erosion from storm water run off as well as foot traffic. We wish to thank the 60 volunteers including boy scouts and 4-H who worked diligently to stabilize the stream banks to prevent further erosion and sedimentation. 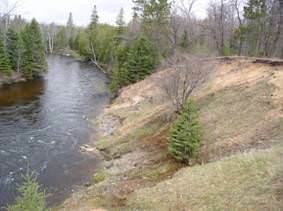 A series of three erosion sites on the banks of the Upper Black River, just upstream from Black Lake, are threatening the ecological integrity of this stretch of high-quality, cold water habitat. In addition to the ecological degradation associated with an increase in sediment input to streams, these sites are of particular interest in that this stretch of the Black River is known spawning habitat of the state-threatened lake sturgeon. Preventing the further erosion of these sites and resultant input of sediment to the stream will help protect and restore the sensitive spawning habitat of lake sturgeon. The three erosion sites affecting the sturgeon spawning habitat were identified in the Black Lake Watershed Stewardship Management Plan, approved by the Michigan Department of Environmental Quality (MDEQ) in 2001. The position of the sites in relation to the river and direction of flow, the presence of heavy foot traffic from the general public, and gullying associated with stormwater runoff were all cited as the sources of the erosion. 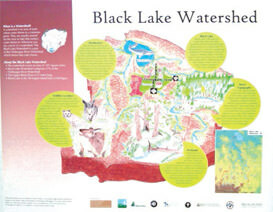 In the Black Lake Watershed Management Plan these sites were listed as "severe" erosion sites and it was noted that they are contributing to the sediment load, the Black River's number one pollutant. Stabilize the shoreline and prevent further erosion and sedimentation using bioengineering techniques. This project will focus on using Large Woody Debris (LWD), coconut fiber logs, terracing, and live plantings to minimize further erosion. Manage the source causing the increased erosion of the streambanks: human traffic viewing the sturgeon and accessing the river. Provide educational/interpretive materials to the general public to teach about the environmental damage caused by unrestricted access to the site and the importance of using the designated path or viewing area. This is also a great opportunity to educate users about the watershed and its management, non-point source pollution, and habitat for endangered species. Project partners, including Sturgeon For Tomorrow, the Michigan Department of Natural Resources, and Huron Pines are working diligently to raise matching funds. Current funding for the project stands at $38,000, provided through a grant from the National Fish and Wildlife Foundation. For more information on this project, please contact: Patrick Ertel, Project Manager, Huron Pines, (989) 348-9319 ext. 19.